The Ottawa Hospital is moving quickly to close the in-house cafeteria kitchen at the Riverside Campus that serves patients, their families and staff these “home-style” meals and replace it with an outsourced take out food company. 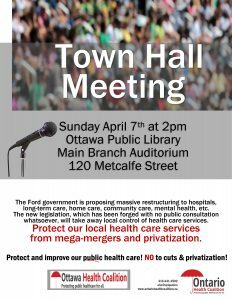 Please take a minute to sign the online petition that asks the Ottawa Hospital to keep the Riverside Cafeteria open and to stop the contract the hospital is planning to sign with a fast food chain. Replacing home-cooked meals with fast food is a bad idea. When a hospital does it, it’s really a bad idea. Many of the more than 300 patients each day who receive care and support from the kidney, dialysis and other clinics at the Ottawa Hospital’s Riverside Campus get vouchers for a home-style meal at the in-house cafeteria following their treatment. Patients’ family members often eat with them. Ottawa Hospital staff also enjoy meals at the Riverside cafeteria. But the hospital is moving quickly to contract out the in-house kitchen to a fast-food chain. We feel the hospital should lead by example and not only continue to operate the in-house Riverside cafeteria, but make it better by serving even more wholesome, nutritious meals. If you agree with us and want to keep the Riverside cafeteria cooking, please take the time to sign our petition. Jewitt in April. More updates to follow after those meetings. To view the current edition of The Journal please click here.